You started your own business because you want to be your own boss, you’re passionate about something and maybe even want to change the world. At first the life of an entrepreneur sounds exciting. Then when you’re running your own business the reality hits you – it’s not always so glamorous. You have so much to do. You’re your own boss but you’re working 12 or even 15 hour days. There’s so much to do! You’re overwhelmed and there’s so many priorities. You feel busy but you’re not getting the results you want. You’re doing so much but there never seems to be enough hours in the day. Have I mentioned how much there is to do? You’re not alone. Many if not most entrepreneurs at some point (or forever) feel this way. But it doesn’t have to feel so chaotic. You can get control over your business and move from being reactive to proactive. But it takes deliberate effort, and a lot of focus. Here are 8 common mistakes that cause you to stay in the reactive mode instead of being proactive. When you start your business you want – and often have to– say yes to everything. You need the business. You’ll take any client. You’ll take any project. You’ll speak at any event possible to get your brand out there. The problem is that as you grow, you continue saying yes to everything. And eventually you start saying yes to too many things, that prevent you from saying yes to the things that matter. Time is finite. Extremely successful entrepreneurs are extremely good at managing their time and say NO. What to do instead: Exercise saying NO. Say no to the types of projects that are not your area of expertise. Say no to clients that aren’t your ideal client and will cause headaches down the road. Say no to events that aren’t a great use of your time or that you’re not excited about. Say NO to solving problems that aren’t the top priority. Saying No doesn’t necessarily mean No forever – it means NO, not right now. By saying NO, you’re freeing yourself up to say YES to the things that really matter and the things that will move you closer to accomplishing your goals. The problem with writing down a to-do or priority like “work on marketing” or “find new leads” is that it’s too vague. It isn’t clear what you’re trying to accomplish or how you’ll know when you’re done. You end up struggling to start or not knowing when you’re finished and time runs away on you. What to do instead: Set SMART Goals. SMART stands for Specific, Measurable, Attainable, Relevant, and Timely. Setting SMART goals helps you make sure you’re focused on what you’re trying to accomplish and when you know you’ve completed it. For example, instead of “work on marketing” try “schedule 3 social media posts for this week”. Instead of “find new leads”, try “attend 1 networking event and get 3 email addresses”. Being specific about your goals for the week forces you to think more strategically about what you’re trying to accomplish and should also help you have a better understanding of how much time you’ll invest in each priority. You have a long to-do list and it seems never ending. There are always new things being added to it. So how do you take control of your to-do list before it takes control of you? By being focused and deliberate. If you have a long to-do list with new things constantly being added to it each day, don’t start from the top and work your way down. What to do instead: Rview your to-do list and ask yourself “What are the most important and most impactful things I should focus on this week?” Focus on those things first so you’re being deliberate and strategic about where you spend your time. What are the things on that list that will be most impactful in helping you achieve your goals? Daylite Tip: I use Daylite to stay focused on my top priorities by pinning the top priorities for today on my Worklist so they’re front and centre. As an entrepreneur, you have a lot on your mind. You have people to follow up with, meetings to go to, and things to do. Don’t make the mistake of trying to remember it all yourself. You’re human and you’re bound to forget. 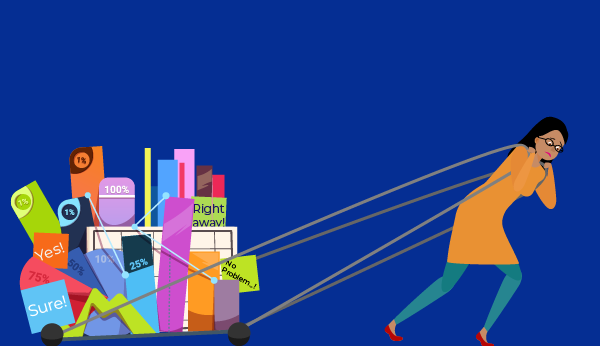 Even if your memory is excellent, you’re wasting up mental bandwidth by remembering little things when you could be freeing up your mind to focus on more important things. This is especially a problem if you’re a creative type. If your mind is busy remembering when to follow up with people or what you have to do before next Wednesday, you’ll have less mental bandwidth for your creative work. What to do instead: Use a system to remember all the things you need to do and places you need to be. For example, a tool like Daylite to set reminders for when you need to follow up with people or when tasks are due. That way you can free up mental bandwidth to have more creativity and strategic ideas. Daylite Tip: Learn how to use Daylite to set automatic reminders for to-dos in this tutorial, and how to create a follow up schedule in this tutorial. Do you have days where you start off being super focused on what you need to accomplish today, then before you know it the day is over and you haven’t accomplished what you planned you would? You’re probably not doing a great job at managing your priorities and your time. What to do instead: From your list of priorities for today, order them and estimate how much time each one will take you. Use your calendar to block off time in your calendar for each of those key priorities. Will that most important task take you 30 minutes or 5 hours to do? Block it in your calendar. Then the next task, how much time will that one take you? Doing this will force you to be realistic about the time you have so you can prioritize accordingly. It also helps you get better at estimating your time. Daylite Tip: I use the Daylite calendar to block off time in my schedule and I assign a category to each type. For example, a category for writing, general marketing activities, customer research calls, etc. The time blocked in is an estimate, but if it takes longer I’ll update that in my calendar as well. This way I can easily review my calendar for the week and get a sense of where most of my time is being spent. The fact that it’s colour coded by category makes this easy to digest. This also helps with planning ahead because I can look back a few weeks and see on average how much time different types of tasks took. For example, maybe I only thought a blog would take an hour or two to write, but then looking back in my schedule I can see on average they actually take more like 3 hours. Since doing this, I’ve gotten way better at estimating my time for things. It’s not perfect, but much more accurate than before I was using my calendar to block time for tasks. Fires happen that will need your attention. When it becomes a real problem is when you start spending majority of your time fighting fires. If you allow fires and emergencies to dictate your time, you won’t have enough time to push forward the priorities that actually matter and you won’t reach your goals. What to do instead: Use Steven Covey’s Time Management Matrix. 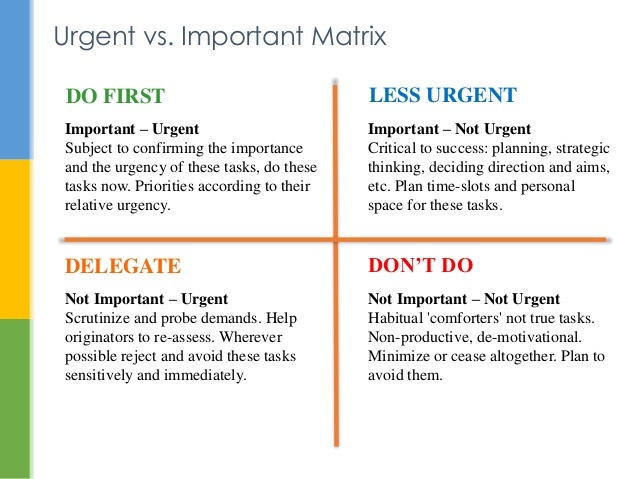 The goal is to spend most of your time in the important and not urgent quadrant, while prioritizing what’s important and urgent. When something comes up that’s urgent but not important, delegate it. Let your team step up and take more ownership over things so you don’t have to be the bottleneck and go-to for every little problem. If something is not urgent and not important, say NO to it. Again, this may not mean NO forever, it may just mean NO right now. Daylite Tip: When dealing with an overloaded inbox (like say when you just get back from vacation) I find it super helpful to apply this time management matrix to every email in my inbox. Each email that comes in I’ll ask which quadrant it fits in. For urgent but not important emails, I can delegate them using Daylite Mail Assistant. For important and urgent I’ll deal with it right there if I can, or action a task from the email and pin it to my Worklist. Learn how to manage emails using Daylite in this tutorial. Often times we have good intentions at the start of the day. We identify the most important thing we need to focus on today, but then life gets in the way. We spend most of the morning answering emails and never get to that important task. Or people keep asking us questions so we never get to the thing we planned on accomplishing today. Or maybe you get dragged down the Instagram or YouTube vortex and it’s not until hours later that you realize how much time you’ve just wasted. Distractions are real. They’re everywhere. Our phones, text messages, email, Slack conversations, people stopping by your office to ask questions – they can all be distractions that prevent us from accomplishing our key priorities. What to do about it: Be proactive about reducing distractions. When you plan out your day, set time aside for your most important tasks. During those times, turn your phone to vibrate or turn it off if you need to. Close Apple Mail so you’re not distracted by new emails coming in. Close your office door or set your Slack status to “busy”. Give your team the heads up for when you’re going to be busy today and when you’re available for questions. We have 10-15 minute daily huddles in the morning so people have a space to identify key priorities and bottlenecks. This way they have a place to raise issues and ask questions so I don’t get pulled in a bunch of different directions throughout the day with questions. Once your focused time is up and the priority you set for the day is accomplished, you can open your email or turn on your phone to check whatever you need to. By planning time for focused work and time for distractions, you can focus and accomplish what’s most important without feeling like you’re missing out on anything. When you start your own business you need to be a Jack-of-all-trades or Jill-of-all-trades. You have to do everything. The problem is that as you grow, the thing that made you an entrepreneur can be what stifles your growth – you being in control. You try to do it all yourself or oversee everything done by your employees. You become a micromanager and limit your company’s growth because you become the biggest bottleneck. What to do instead: Delegate, delegate, delegate. You have to get comfortable delegating so you can focus your time on the most impactful things, and other people in your company can take care of the rest. Set the expectation for what success looks like and any limitations or parameters, then step back and let your team do the work. Moving from reactive to proactive can be challenging, but it’s possible with deliberate effort and focus. Try these tips and let us know if they’re helpful for you!